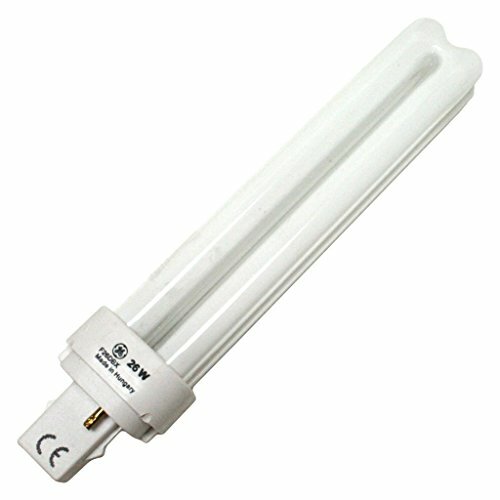 The mercury content of GE 97608 Ecolux Biax T4 lamps has been reduced by over 80 percent versus older traditional fluorescent lamp designs. To assure long life, advanced coating technologies have been developed to minimize the absorption of mercury within the lamp. Additionally, Ecolux lamps use an exclusive material design that helps to prevent the small amount of mercury in the lamp from forming mercury compounds which may leach into groundwater after lamp disposal. This 97606 plug-in CFL shines at 1,710 lumens with a halogen white color temperature of 3500K. Best when used for long operating times, this lamp is great for facilities, retail display, hospitality, office, restaurant, and warehouse applications.